As educators, we often want to address deep, important topics with our students, but we’re at a loss as to how to do so appropriately. You may worry that a topic is too intense or ‘grown-up’ for your students, or worried about discussing controversial topics in the classroom, or you may be concerned that you won’t do the topic justice. One such topic that you may wish to address is residential schools. As part of her article Implementing Indigenous Education Policy Directives in Ontario Public Schools: Experiences, Challenges, and Successful Practices, published in the International Indigenous Policy Journal: vol.8 issue 3, Emily Milne, an assistant professor of sociology at Waterloo University, surveyed 100 teachers and parents in Ontario. 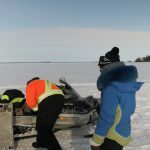 She found that some non-Indigenous educators in Ontario feel “uncertain about what to teach and how” when it comes to Indigenous cultures and histories. This is likely how many teachers across the country are feeling. 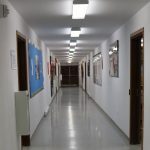 This blog post will discuss the use of novel study as a way to teach, and open up discussions, about residential schooling with students of any age. While reading this post, keep in mind that although we focus on residential schooling specifically, novels are also a great way to open up discussions on topics such as racism, empathy, and social activism. It has been well researched and documented that teachers and parents can help foster empathy, acceptance, and a drive for social change through reading literature. Reading literature can also be a way to address difficult ideas and concepts. In a recent CBC article Jo-Anne Chrona, a curriculum developer with FNESC, expressed that reading books can create a space for conversation about difficult topics, residential schools in particular. Using novels to discuss residential schooling may help students feel safer talking about how they have affected their lives and the lives of their families. Since this topic may hit very close to home, students have the opportunity to talk about these themes through the eyes or perspectives of the characters in the novels they read first, before confronting them in their own lives. Some students may not be aware of the effects of residential schools on those in their community. In order to bring the struggles of the characters to life, it may be a good idea to invite an Elder or a community member who was affected by or went to, residential school into the class to speak to the students. Hearing about residential schools from both a novel and from a community member may help students to understand how residential schools continue to affect Indigenous peoples and communities today. Be sure to follow any appropriate protocols for inviting Elders or community members into the classroom. It is important to note that your students may be deeply impacted by the topic of residential schooling. It will be important to foster a safe space within your classroom for your students during the time they are reading these novels and while discussing them. You may also want to include time and make space available for students to take a break from the discussion or activity if they are feeling overwhelmed. I’ve included some resources at the end of this article to help you learn about creating safe spaces and having a trauma-informed practice. I’ve outlined below three different novels, The Secret Path, Fatty Legs, and Good For Nothing, that address the topic of residential schooling in different ways. These can be used with different age groups by addressing the topics and themes in them at different levels. The Secret Path is a graphic novel which was written and illustrated by Tragically Hip lead singer Gord Downie and Jeff Lemire. Complementing the graphic novel is a ten song album. This story was also turned into an animated film, which aired nationwide on CBC Television. The Secret Path tells the story of Chanie Wenjack, a young boy who died while trying to escape from a residential school in Ontario. The novel Fatty Legs was written by Christy Jordan-Fenton and Margaret Pokiak-Fenton. This autobiographical story chronicles Margaret’s experiences leaving her community and going to residential school. The final book, Good for Nothing, was written by Michel Noël. It tells the story of Nipishish, a young man who feels out of place everywhere. It discusses the ongoing legacy of residential schools in the lives of those who survived them. Any of these three novels could be used to begin discussions on residential schooling at the high school level. The Secret Path will also work very well for elementary school and middle school-aged children, and Fatty Legs works well for upper elementary to middle school students. Good for Nothing would work best in a high school class due to some of the language used and also because it follows the main character into adulthood so the themes may be more mature. At Learning Bird, we have created lessons that you can use to support the inclusion of these books in your class. These lessons vary in content, with some introducing the history of residential schools, and others designed to help students analyze the novels based on the theme, character, and other literary devices. Below, you will find one sample lesson for each book, along with a description of what students can learn in the lesson and how it could be used in your class. In this activity, students write letters to an imaginary stranger, only to be told that they are not allowed to use a number of basic words like “the”, “and”, “me” and “to”. Students rewrite their letters after removing these words and try to make it understandable. 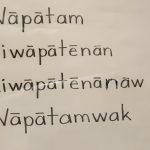 This activity is all about losing your language and being unable to express yourself, which is something many students who went to residential school went through, and may still feel the effects of today. This activity could be used during or after reading the novel. It will reinforce the theme of lost language from the story and open up a discussion on how being unable to express yourself makes you feel. This, in turn, can become a discussion of the long-lasting effects of residential schools and all the things that were lost while children were forced to be away from their families. If you would like to learn more about the lessons we have created to support you in teaching The Secret Path in your class, take a look at our previous blog post. All these lessons are free and available for any teacher to access and use in their classroom. This lesson is a great introduction to the novel Fatty Legs. It helps students make predictions about the novel and leads them through a couple of pre-reading activities. It also gets students ready to read other novels, by explaining that the strategies outlined in this video can be used before reading any book. This lesson would be best used before reading Fatty Legs. It can be used as a hook for the novel to get students interested, and can also be used to introduce the idea of pre-reading activities. In this lesson, students are introduced to the concept of formally critiquing a character. They are given a few criteria which they can use to critique a character and then they practice by critiquing the character of Mona Paradis. These criteria can then be used to critique any character, from any book. This lesson should be used with students after they have finished reading Good For Nothing so that they have all the information required about the character Mona Paradis to do the critique. This is a great introduction to critiquing a character, and the act of critiquing in general. After viewing this lesson students will know to formulate opinions about characters and to do more than simply say ‘I didn’t like this character’ when you ask them their thoughts. Discussing the plot points and themes found in books such as these will also allow you to open up discussions that can be difficult to get going in a classroom, such as talking about the terrible things that happened in residential schools and the enduring legacy they have left among First Nations, Métis, and Inuit populations. These books, and others like them, can be especially helpful in starting these discussions if you feel ill-equipped to address these topics in class directly. The following resources will help you best support students who may be triggered while reading about or discussing difficult topics in schools. This can also help students who may be reliving traumatic events while discussing topics such as residential schooling. As schools and school boards across Canada introduce a curriculum that deals with the topic of residential schooling, as per the Truth and Reconciliation Commission of Canada’s call to action regarding education for reconciliation (#63), many educators are seeking resources to help them do this topic justice. Included below are some additional resources you may find helpful to broach this subject in your class. Rebecca is a former Junior High teacher who taught in Nunavik (Northern Quebec). She is interested in exploring how to bring Indigenous perspectives into the classroom and how to use literature to teach different academic concepts. In her free time, she enjoys reading everything she can get her hands on. 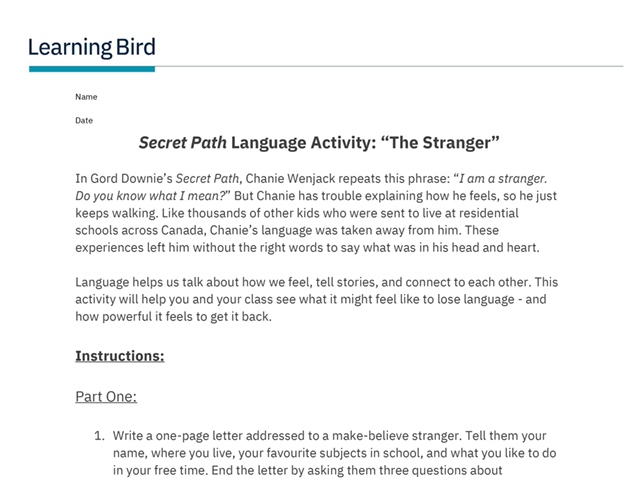 Our blog helps you stay connected to Learning Bird and see what we’re up to. It offers insightful articles, classroom ideas, product tips and tricks, and updates about our team’s travels.